Parents in HCM City are having difficulties finding a babysitter or where to keep their children when local schools start the Tet holiday a week early. Many primary schools have let the children stay at home since January 26 while the holiday for the adults will start a week later. Parents have enrolled their children in extra classes and those with small children are searching for nurseries that are still opening. However, the tuition for extra classes that offer soft skill training and traditional cultural experiences during those days are much higher. Parents often have to pay from VND500,000 to over VND1m a child a day. "Our daily wages can't even be compared to the tuition but we have no other choice," said Tran Ngoc Bich in Binh Thanh District. Other families decide to send their children to the grandparents or take turns staying home. Le Thu, a parent with a first grader, said her daughter accompanied her everywhere, from the workplace to meetings with clients. She gave her daughter her phone to keep her occupied. Thanh Trang in Thu Duc District said she had planned in advance and spent the days on Tet preparations. 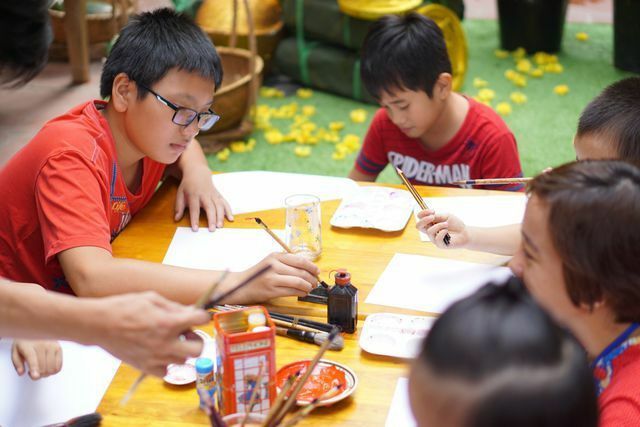 Tet holiday for pupils starts from January 28, however, schools officially closed on January 26 which was Saturday. As a result, pupils will have 16 days off. Officials will be off from February 2 to 10. HCM City has had the longest Tet holiday in recent years.